In central Portugal, between Coimbra and Castello Branco, there are some beautiful traditionally built schist villages (aldeias de xisto). Schist is the stone they are built from, similar to slate (a type of crystalline metamorphic stone. It is easily split, creating a flat surface, making it good to build with. The layers of stone create a mixture of vibrant colours from rusty reds and slate greys. 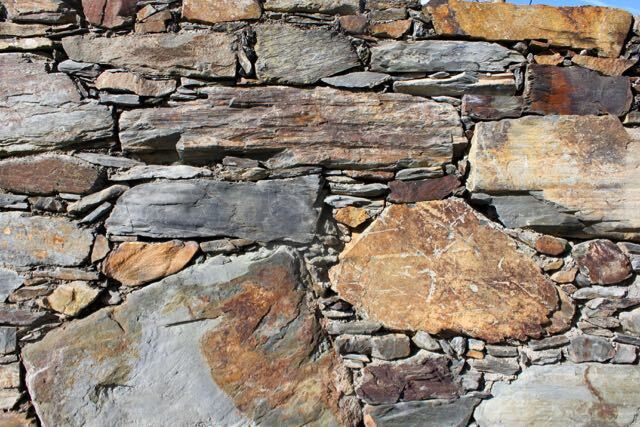 Schist buildings remind me of the iconic dry stone walls of England, the fact that a craftsperson has jigsawed together all of these pieces to create a building, somehow they seem alive and so alluring. The earthy tones of the stone, together with a red clay packed between the complex arrangement of protruding stones, really makes this a bewitching building material. When the sun shines on the schist it looks truly awesome. There are many abandoned schist buildings and schist ruins. The families and generations of families who lived there once have all left to find work in the bigger towns and cities, as unemployment is pretty rife in Portugal. With an average wage of €500 per month, even people with jobs struggle to maintain their homes. Some villages have benefited from cash injections from people renovating schist buildings as their second home, holiday home and people from overseas looking to move to Portugal on a budget and find do-up-and-mend ruins; cheap land, cheap ruin and the option to make your mark. The great thing about schist villages is that not only are they beautiful but there are also fantastic walking routes to take in the village and surrounding area. The smaller PR walks (Pequeno = small R = Route) are around 2-10km and leaflets are available in the municipal’s tourism office in both english and Portuguese. For the more adventurous, there are also mountain biking routes and GR (Grande = Big), much longer routes that traverse the country. Both hubbie and I love to walk, we spent tonnes of our LBK (Life before kids) walking, in Kent, in the Lakes, Lancashire, Norfolk, Devon…wherever we could in the UK and abroad. The summer of 2012 we had planned and booked our flights to walk over 500 miles on a section of the The Camino de Santiago also known by the English names of the Way of St. James. We walked from St Jean Pied de Port in France to Santiago de Compostella and then onto Finesterre in Spain. I didn’t know at the time but we would also be taking Chaos with us, as I was 9 weeks pregnant when we started the month long walk, before we cut it a week shorter than originally planned to have the 13 week scan. Anyway, I digress, we Love to walk so having two young kids has cramped our style a little but rather than quit walking completely, we now carry the boys in a Boba and Ergo and walk shorter routes. So the PR routes, well the shorter ones, are pretty perfect for us. The majority are circular and take in some stunning views of the schist villages and inevitable pine and eucalyptus forest that surrounds them.